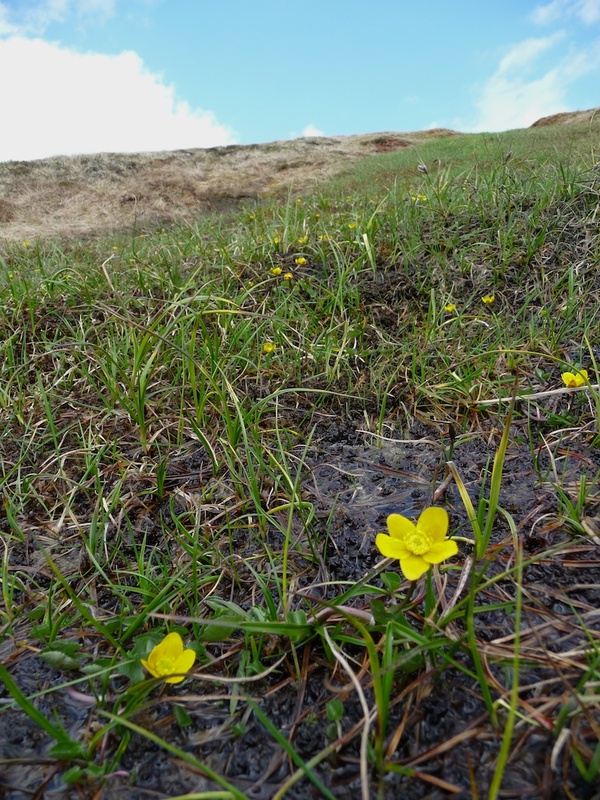 The kingcup or marsh marigold is a familiar sight in wetlands and damp grassy areas, its brilliant yellow flowers braving the cold winds of early spring. 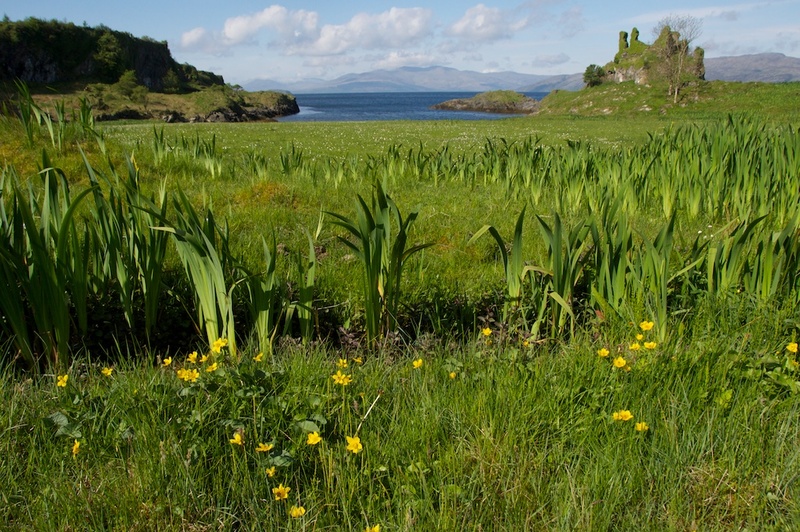 I didn’t realise until recently that it was known in Gaelic as Lus bhuidhe bealtuinn, ‘the yellow plant of Beltane’. At the end of the last Ice Age, it’s believed that marsh marigold was one of the plants that took advantage of the fertile ground newly exposed by the retreating ice, spreading quickly throughout the boggy areas. It is not confined to Britain, being found throughout the northern hemisphere including Northern Asia and parts of North America. 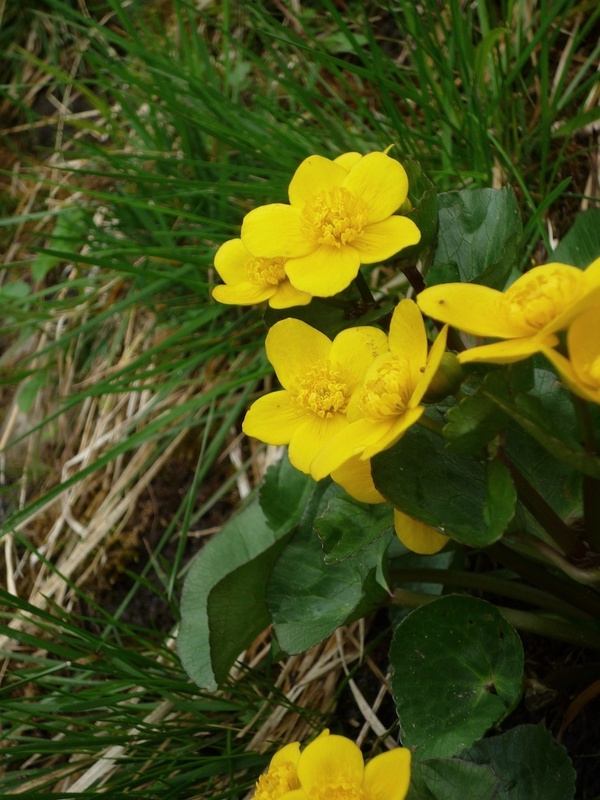 Its age-old presence in these islands may explain the proliferation of folk names for marsh marigold, some of them delightfully weird: May blob, horse blob, crazy Beth, publican’s cloak, water gowan, cow lily, soldier’s buttons and publicans-and-sinners are just a few. The name ‘marigold’ or ‘Mary’s gold’ hints at a link with the Virgin Mary, although this is by no means the only plant to hold that claim. In traditional May Day celebrations, marsh marigold was one of the flowers collected and placed in windows and over doorways, along with sprigs of rowan, gorse, hazel and, of course, hawthorn – the May tree itself. On the Isle of Man it was known as Lus y Voaldyn, the herb of Beltane, and was believed to be a powerful protection against witches; while in County Antrim, children would push a kingcup blossom through the letterbox of every house in the village, as a token to ward off evil. Almost sun-like in their brilliance, five-petalled marsh marigold flowers can be seen as early as March, providing an important early source of nectar for insects, and will continue to appear until July or August. Look for them in damp, shady areas – the boggier the better. The kidney-shaped leaves are a luxuriant dark green, but beware, as they can cause skin irritation. Its Latin name is Caltha palustris: ‘caltha’, from the Greek kalathos, meaning ‘goblet’, and palustris, meaning ‘of the marsh’. It would be nice to know when the name ‘kingcup’ first arose: I like to think that it might have something to do with King Alfred, lying low in the wetlands of Somerset as he gathered strength to defeat the Vikings, but I would like to point out that this is purely a figment of my imagination. Whenever it first came about, it’s easy to see how the rich gold colour and cup-like buds suggest the wealth and power of kings. or take a walk around Castle Coeffin, where the marsh marigolds were photographed. Hope so too, Lynne! Freezing up here at present. Can’t last for long, it’s nearly May! I’m amazed! I have known and loved this plant since I was a child. I did not realize it was international. Our area was glaciated, if that’s the word. The area where I see them has many springs and is considered a micro-climate, very different from the drier prairie that predominates here. The American Indians used them as a medicinal plant. Very cool to find out they were part of Beltane. But ours are protected, so I won’t be picking any. 🙂 What a lovely thing to have in common. I know – horse blob doesn’t really make sense! Looking forward to getting out and seeing more of them.